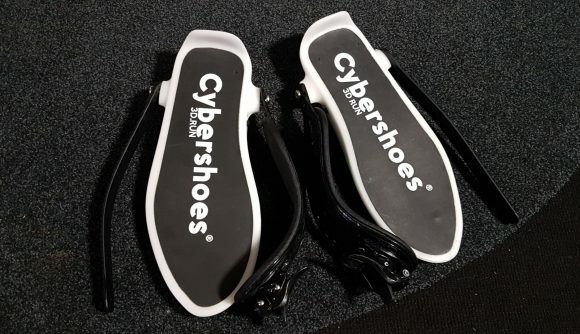 October 8, 2018 Cybershoes, the footwear that allows you to run and jump in virtual reality, has already surpassed its original funding goal with 23 days remaining on the campaign. Cybershoes is a half Heely, half slipper wearable that allows you to walk and run in virtual reality with relative ease. While treadmills and full-body harnesses have been trying to perfect freedom of movement in VR since the tech’s humble beginnings, after trying out Cybershoes for myself at Gamescom, I have to say it’s one of the most effortless and truly freeing VR peripherals out there – and one that you might actually be able to set up in your home. The VR peripheral has already surpassed its rather modest $34,537 funding goal, and is currently sat at $185,573. There’s still plenty of time left for the Kickstarter campaign, too, with 23 days still on the timer before the project is officially funded – ending on November 1. The system relies on two, what I like to call, techno-slippers, which fit snugly on the underside of your shoes with a chunky strap. The slipper itself is a pretty minimal ordeal from the outside, too. The underside features one cylindrical roller – the purpose of which is to help you effortlessly glide around and to capture the motion of your feet and translate that into the game itself. Aside from a few LEDs, that’s about it. Evidently, you aren’t just left to skate around in a VR headset, so another critical part of the Cybershoes experience is a tall spinning chair or stool, one which you can just about touch the floor while sat on that also allows full 360° motion. The Cybershoes booth also opted for a bungie harness system for the HTC Vive’s cable. However, with the Vive Wireless adapter now on the way, this seems like the perfect combination for at-home untethered VR – if you can stomach the wireless adapter’s price tag. And while I was apprehensive at first – mostly at how the seated position would feel while running – the experience is actually rather seamless. You have to briefly learn how to walk again with an overacted swagger to get the device to always register every step, but after just a couple of minutes that initial apprehension was long gone. I found myself running up to enemies in Doom to get up close and personal with a shotgun. On very rare occasions, I would instinctively back away in the opposite direction when things got a little too close for comfort and I was about to get torn to shreds by hell-beasts. The current standard in-game teleportation method of moving a player around in VR is a simple solution to the rather tough problem of mobility in VR. And it’s not bad, but it’s far from a seamless VR experience either. Cybershoes offers a genuinely impressive way of adding that extra layer of in-game control that action games, especially fast-paced ones such as Doom, really need to flourish in virtual reality. It’s also not a bad workout, will work with almost every VR game out there, and supports most of the major VR headsets. It’s tough to find that sweet spot of full virtual mobility that’s also accessible enough to actually work in the mainstream. Cybershoes is now available on Kickstarter for funding, starting at $199, and just might cut it, however. The campaign even tells you which Ikea lamp is best for a cheap tether-bungie system, too. If Cybershoes can get the formula down, these VR slippers might be a promising start to achieving that fully immersive home VR experience that enthusiasts have been waiting for.